For a meaty essence, producers dangle raw chicken breast over their stills. One of the first things you need when distilling a batch of mezcal de pechuga is a chunk of raw chicken breast. Its purpose: temper the flavor of an already strong spirit. A quick mezcal primer: The classic Mexican liquor comes from the core of the agave plant, known as the piña. After roasting the piñas, creating the drink’s signature smoky essence, mezcaleros blend them with fruits, nuts, and spices. Traditionally, they then ferment and distill the mix three times. 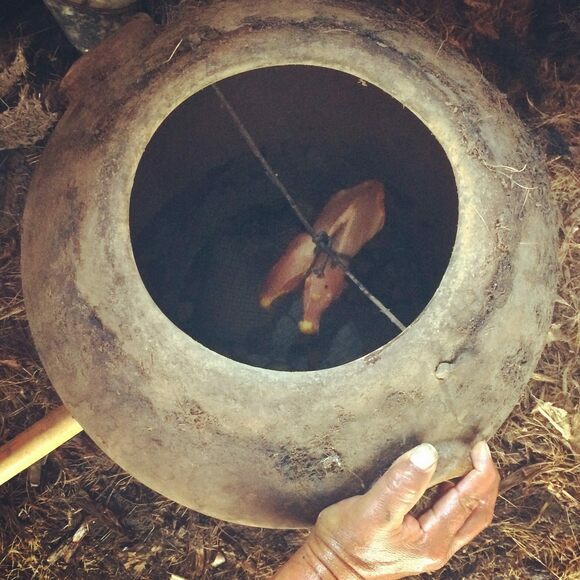 It’s in this third round of distillation that mezcal de pechuga producers add a special step. To help counterbalance the mixture’s bracing flavor, the mezcalero hangs a raw chicken breast over the open copper still, allowing the spirit’s vapors to intermingle with the chicken’s meaty essence. Some liquor historians believe that this additional step began as a way to mask the flavors of subpar mezcal and has since become part of tradition. In Mexico, mezcal de pechuga is commonly consumed during special occasions, like quinceañeras and weddings, but it’s also gaining popularity in the United States, where mezcalerias serve it alongside bottles of more traditional mezcals. So now for the big question: Does mezcal de pechuga actually taste like chicken? Not quite. Any hints of meat are often overshadowed by the stronger flavors of spice and fruit. In fact, if you didn’t know about this additional step of the production process, you probably would be none the wiser. Some versions of mezcal de pechuga feature other types of meat, including rabbit, iguana, or Ibérico ham. This restaurant with two locations in Seattle serves pechugas from five different producers with tasting notes as varied as "Basil, lemon, ocean, fruit, smoke, chicken" and "Fruit, anise, turkey".